Lawmakers From Both Parties Find Home Turf Cuts Tough : It's All Politics Even deficit hawks are finding it hard to cut spending and jobs in their own districts. An example getting a lot of notice this week is Speaker John Boehner's support for a fighter jet engine the Pentagon doesn't want. Making the engine provides thousand of jobs near his district. 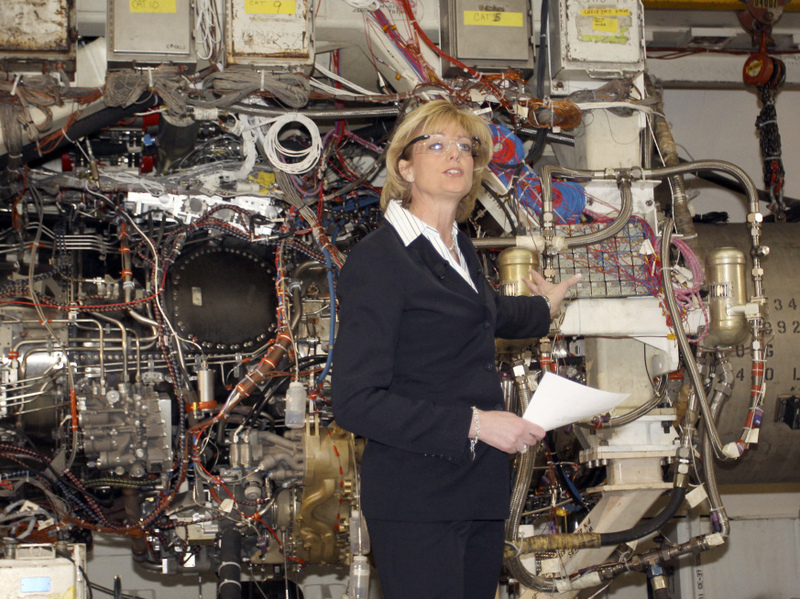 GE Aviation's former president, Jean Lyndon-Rodgers, in 2009, showing off the joint strike fighter engine in Evendale, Ohio. Updated at 3:45 pm: The U.S. House voted to kill the alternative engine program for the F-35 Joint Strike Fighter in a 233 to 198 vote. Whoever had the notion to spread Defense Department contracts around the country was brilliant; the thought of losing jobs back home sure makes it hard for even deficit hawks to ax these programs. Take the back-up jet engine for the F-35 Joint Strike Fighter made near Speaker John Boehner's Ohio congressional district. The Defense Department wants to kill the contract for the General Electric engine. But Boehner hasn't exactly embraced the idea. At a Tuesday news conference, Boehner was asked if he would support a bill by fellow Republican Rep. Lynn Westmoreland (R-GA) to cut spending on the engine. SPEAKER BOEHNER: I suspect there will be a healthy debate on that big question. As you all know, that I believe that over the next 10 years this (the GE engine) will save the government money. But let's have thepolicy debate out in the open on the House floor, and let the House work its will. But it just so happens that a GE plant that develops the second engine employs 7,000 people in Evendale, Ohio, near Boehner's district. Rather than take a so-be-it attitude toward jobs his constituents may hold, he's backing an earmark-like provision in the spending legislation to keep funding the unneeded GE engine. Politico also mentions Boehner and the GE engine in a story on how deficit-fighting lawmakers want to make exceptions for spending in their districts. So as they bash President Barack Obama's budget, Sens. John Barrasso (R-Wyo.) and Joe Manchin (D-W.Va.) are upset about his proposed cuts to coal subsides. Sen. Ben Nelson (D-Neb.) wants to protect his state's agriculture interests, and his fellow Nebraskan, GOP Sen. Mike Johanns, is concerned about cuts to airport grants. Sen. John Cornyn (R-Texas) says everyone will need to feel some budget pain — but he's weighing how much pain NASA should feel. Just more proof of what has no doubt been true since the first hunter-gatherer tribal chieftain gave extra pieces of the kill to some members of the tribe whose support he needed to remain chief. As Speaker Tip O'Neill famously said: "All politics is local."